Hot flashes are one of the most common symptoms of menopause, affecting about 75% of all women making “the change”. Trademark characteristics of hot flashes include periods of intense heat followed by perspiration. The herbal supplement black cohosh has been championed by women as a cure for menopausal hot flashes for decades, but does this herb really help treat menopausal hot flashes? Read on to learn more. Black cohosh is a perennial flowering plant that grows in the eastern woodlands of North America. It has been used for centuries by Native American tribes as a cure for female ailments such as PMS symptoms and menopause symptoms. The herb started to gain popularity as a treatment for menopause in the 1940’s when clinical trials were done to assess black cohosh’s effect on the performance of vasomotor symptoms like hot flashes and night sweats. It was once believed that the herb contained phytoestrogenic properties, or plant-based compounds that mimic the effects of estrogen when introduced into the body. Thus in theory, black cohosh would alleviate menopause symptoms by balancing hormone levels in the body. Yet new research has contradicted this belief, leaving scientists to wonder exactly how this mystery herb works. It is thought that black cohosh works as a selective estrogen receptor modifier and that it also may exert an agonistic effect on serotonin receptors. Studies on the effectiveness of black cohosh in treating menopause symptoms like hot flashes have remained inconclusive, although scientists still believe the herb shows promise. Some studies have reported positive results from their trials, while others have concluded that black cohosh works no better than a placebo in decreasing the instance of hot flashes in women. Women interested in starting black cohosh treatment should consult with their health care professional. The herb has no known interactions with prescription medications, but reported side effects of usage include nausea, dizziness and headaches. Because long-term side effects of black cohosh have not been studied, experts recommend that usage of the herb be discontinued after 6 months. Unfortunately, natural supplements are often given very little attention by the medical community. Little is known about the benefits and side effects of black cohosh. You should always consult with a doctor before introducing a natural supplement such as black cohosh into your lifestyle. 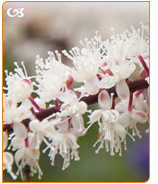 You can also read more about what is black cohosh by clicking here.